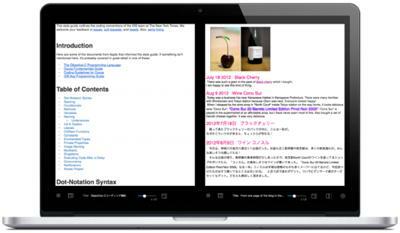 “noteCafe Stylo” is a text editor that can be edited with rich text (RTFD). Font, font color, font style, font size can be easily changed. Headlines can be also set easily. Images and files can also be attached. Images can be resized while checking with preview. 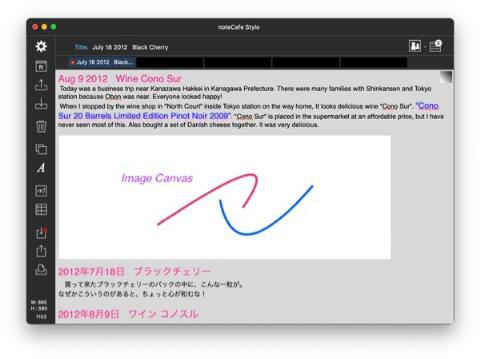 "noteCafe Stylo" is saved in rich text (RTFD). It supports iCloud Drive. "noteCafe Stylo" can also be saved in the sandbox. If you are using the application "noteCafe", it can be saved in “noteCafe”. 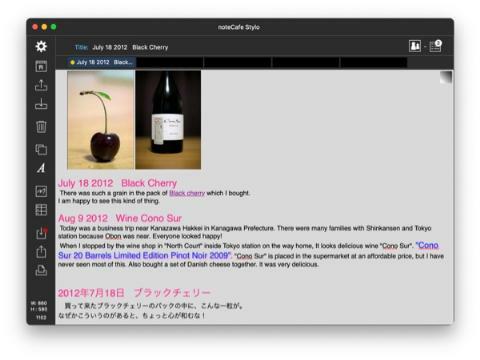 "noteCafe" is an application that can manage pages with categories and tags. 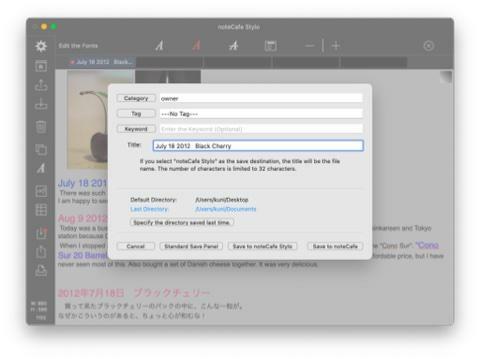 "noteCafe" can quickly find the target page using the page list and abundant search function. Font of new page can be set. The font, font size, font color, font style of the selected character can be changed. Image size can be resized. It is possible to preview. Lists and tables are available. Insert an empty image canvas into the page. Markup function is available. Other file can be referenced. Up to 5 files can be registered and can be switched easily. The reference page can use the select and copy function. 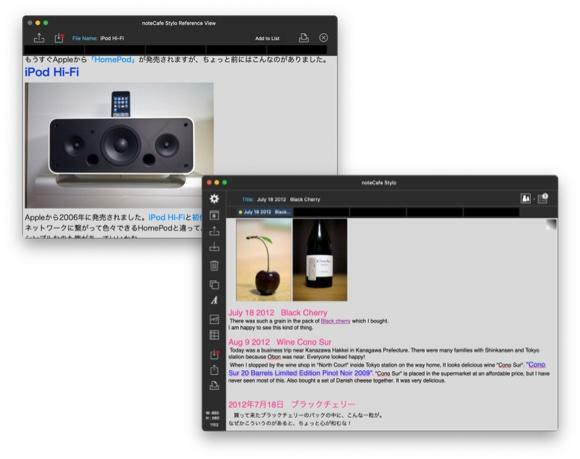 “noteCafe Stylo” saves the page in rich text (RTDF). A standard save panel is available. “noteCafe Stylo" can be saved in the sandbox. if you are using the application "noteCafe" you can save it in "noteCafe". Shared extensions can easily send information to "noteCafe Stylo" from other applications. Standard open panel is supported. It supports iCloud Drive. Font, font color, font style, font size can be edited. The image can be resized. An image canvas can be inserted in the page. Markup function is available. A lists can be inserted. A tables can be inserted. It can be search (search and replace) the page. Other files can be referred. It can be saved in rich text (RTFD). A standard save panel is available. It supports iCloud Drive. It can be saved in the sandbox of “noteCafe Stylo”. 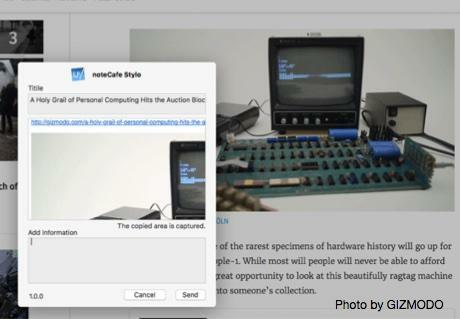 The shared extension of "noteCafe Stylo" is available. Shared extensions can easily send information to “noteCafe Stylo” from other applications. The share Extension of “noteCafe Stylo” is the same as the application "noteCafe". It is accessible from either "noteCafe Stylo" or "noteCafe". 1. When changing the font size, right clicking on the displayed font size field allows you to enter the size directly. It is applied with return key. If more than one font size is included in the selected character string, it can be set to the specified font size. 1. Fixed a problem that sometimes it can not be saved after changing font and font color. 2. A minor bug was fixed. 1. Shared files can be deleted. 2. Shared files can be displayed in the reference window. 3. Fixed a bug when selecting large text including many fonts. 1. The corresponding OS version has become macOS 10.11 or later. 2. Other files can be referenced. The reference page can register up to 5 pages and can be easily switched. 3. The font size is shown. The font size increase / decrease amount can be set to 1 point. 4. Links in the text have been changed to run with Shift + click. 1. Improved operability when saving. The save operation being edited now overwrites the file. "Save as" was added to the file menu. Save panels are available. Note: Saving to the application "noteCafe" does not support overwriting of files. 1. Improved operability at initial startup. If the application 'noteCafe' is installed, iCloud can be used or not. 2. When using the application "noteCafe", it is possible to select whether to use iCloud or not. 1. The image campus can now select the presence or absence of a boundary line. 3.Fixed a bug that unnecessary dialogue may be displayed when pasting image. 1. The number of characters of file names to be saved to iCloud Drive and noteCafe Stylo is limited to 32 characters. 2. ”noteCafe Stylo" can be started from the saved file. 1. Even when "noteCafe" is used, the file name of the read file is entered in the title field. 2. Fixed a bug that title of share file list may not be displayed correctly. 3. A minor bug was fixed. 1. Fixed a problem that sometimes can not be saved when "noteCafe Stylo" is selected as the save destination. 2. Fixed a bug that could not save sentences when iCloud was not in use.